PAULINE BAKES THE CAKE! : Twinkle Star & Owl Balancing Act! Twinkle Star & Owl Balancing Act! 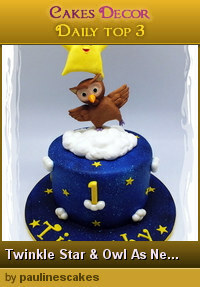 This “Twinkle Star & Owl” cake was commissioned by Lynn for her son Timothy’s first birthday celebration in May. Little Timmy is a very much loved baby because his parents traveled interstate from Melaka (3 hours journey to and fro), braving heavy traffic and rain to collect his cake! As this is my second cake of the same theme, I wanted it to be significantly different and more challenging than the first one I did. So here they are, as never seen before… Twinkle Star balancing on top of the Owl! Woohoo! I can’t help it! I seem to be addicted to balancing acts for my sugar figures at the moment! The cake was also air brushed and tooth brushed for the starry night effect. The Twinkle Star and Owl is from Super Simple Learning’s “Twinkle Twinkle Little Star” YouTube video. The story is about a lonely owl who wants to play and is looking for a friend to laugh and have fun with.He raises his eyes and see a twinkle star in the sky and decides to fly up, up, up…above the clouds and closer to the star.He meets the star and asks:“Do you want to play?”. Click http://youtu.be/yCjJyiqpAuU to play the video. Balancing Twinkle Star & Owl cake for Timothy's first birthday! Woo Hoo! Up, up and away! 3D "Twinkle Star & Owl" sugar art figurines. 3D "Owl" sugar art figurine. From the left... perfectly balanced! From the right... perfectly balanced! Cirque du Madagascar... The Circus Comes To Town!